The British Prime Minister has apologised for Britain’s contribution to many of the world’s conflicts – including the bloody tension between India and Pakistan over Kashmir. 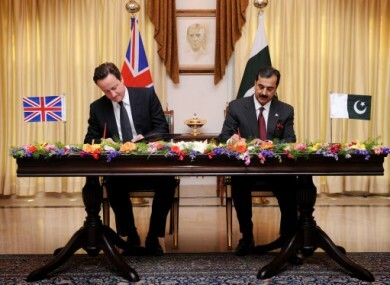 Prime Minister David Cameron signs an Enhanced Strategic Dialogue document between the UK and Pakistan with Pakistan Prime Minister Yusuf Raza Gilani. BRITISH PRIME MINISTER David Cameron has apologised for Britain’s historical contribution to many of the world’s conflicts – including the ongoing tension between India and Pakistan over Kashmir. Speaking on a visit to Pakistan, Cameron replied to a question about how to deal with the problem of Kashmir. “I don’t want to try to insert Britain in some leading role where, as with so many of the world’s problems, we are responsible for the issue in the first place,” he said. Cameron’s comments were well received by his audience – however some have criticised his reading of past events. Director of the Commonwealth Policy Studies Unit Daisy Cooper described Cameron’s attitude as “typical” of the the United Kingdom’s “schizophrenic relationship with former colonies where it is both proud and embarrassed about its past”, the Telegraph reports. Meanwhile, Labour MP Tristram Hunt said that Cameron’s reading of history was “naive” and added “little to the understanding of the problems (these countries) face”. Despite the criticism launched on his comments, Cameron’s words may nevertheless go some way to repairing the damage done to Britain’s relationship with Pakistan last year when, on a visit to India, Cameron sparked a diplomatic dustup by suggesting Pakistan exported terrorism. Building strong ties with Pakistan is a major foreign policy concern for the United Kingdom, given that the 2005 London transit bombings and several other terror plots have been traced to extremists in its one million-strong Pakistani community. The nation also is part of the US-led coalition fighting the Taliban and al-Qaeda in Pakistan’s neighbour, Afghanistan. Britain – along with the United States and other western nations – also gives Pakistan millions of dollars in aid each year to prop up its economy, fearing the consequences of an economic crisis in the nuclear-armed nation. Email “Cameron apologises for British Empire's role in Kashmir conflict”. Feedback on “Cameron apologises for British Empire's role in Kashmir conflict”.